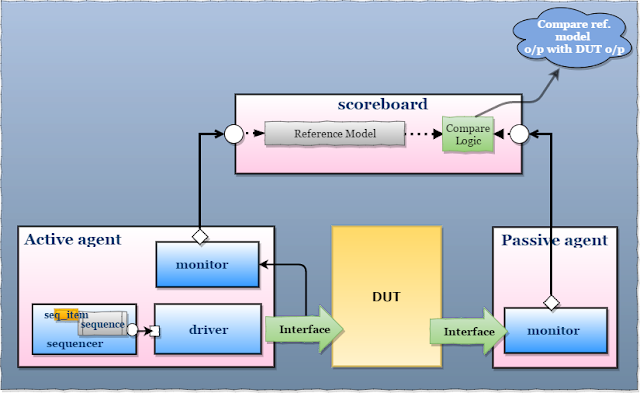 User-defined scoreboard is extended from uvm_scoreboard, uvm_scoreboard is inherited by uvm_component. 1. Scoreboard is written by extending the UVM_SCOREBOARD. Socreboard will check the correctness of the DUT by comparing the DUT output with the expected values. scoreboard will receive the transactions from the Monitors implemented inside agents. Monitor and scoreboard will communicate via TLM ports and exports. 2.The values Generated from reference model. 2. Declare and Create TLM Analysis port, ( to receive transaction pkt from Monitor). 3. analysis export of Scoreboard is connected to Monitor port. 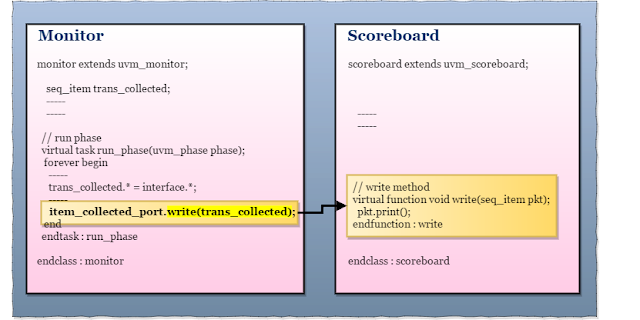 write method of scoreboard will receive the transaction packet from monitor, on calling write method from monitor.